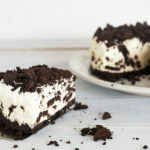 Instant Pot Oreo Cheesecake Recipe - So Good, So Easy! If you think that you have found love in the Instant Pot, wait until you try Instant Pot Oreo Cheesecake! When I made my first cheesecake in the Instant Pot, my family raved about it. So much that they swore it was even better than any cheesecake that they ever had at the Cheesecake Factory restaurant. Oreo cheesecake made right in your Instant Pot! I used to make cheesecake in the oven, and although the taste was great, it was very time consuming and difficult to make it look perfect. Oven cheesecakes tend to crack and you must time it perfectly to get it completely cooked all the way through without overcooking the edges. So I started experimenting with making them in the Instant Pot. Trial after trial, the cheesecakes were much better and much easier than the ones that I baked in the oven. That is when I knew it was time to add Oreos to the basic cheesecake recipe! 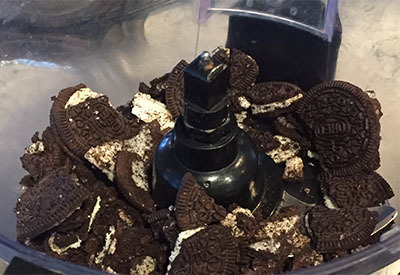 Crushing oreos is made easy with our Favorite Food Processor. 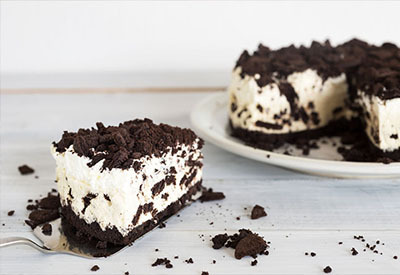 Using an Oreo crust, putting chunks of oreos both in the filling and on top of the cheesecake, and the Instant Pot Oreo Cheesecake became an instant success! Instant Pot Oreo Cheesecake cooling to room temperature. I have had a lot of questions about the type of springform pan that I use in my Instant Pot. I use a 7-inch Springform Pan that fits the 5, 6, and 8 quart Instant Pot. I find it easy to use the springform pan, especially when it is time to release the cooled cheesecake. In fact, I even make casseroles and lasagna in the same pan! If you already a standard springform pan that you use in the oven, please take note. Most oven baked cheesecakes are made in 9 inch springform pans so you will most likely need to purchase a smaller one for use in your Instant Pot. 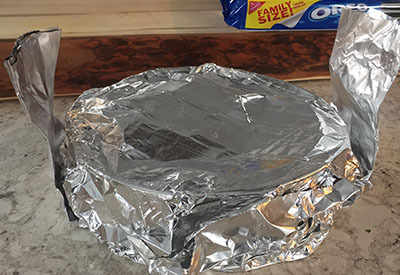 Another hint: In order to easily lower and remove the springform pan from the Instant Pot, you can easily do so by making a sling out of aluminum foil. Take a long piece of foil and fold it in half 2-3 times. Place the pan in the center and use the foil on both sides as handles. No special equipment required! And if you love this recipe, you are going to love our Lemon Cheesecake one too! Creamy cheesecake filled with chunks of Oreos on a chocolate Oreo crust. Topped with whipped cream and Oreos. 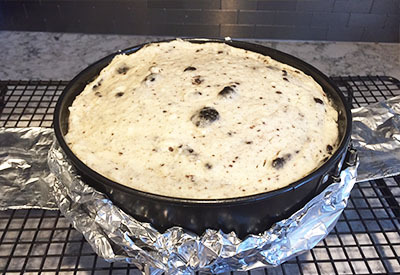 Wrap the bottom of a 6 or 7-inch springform pan in foil. Spray the inside of the entire pan with non-stick cooking spray. In a small bowl, stir together the crust ingredients and press the crumbs tightly into the bottom of the springform pan. Place pan in freezer for 15 minutes. In a large bowl beat the cream cheese, sugar and vanilla until smooth using a mixer. Add eggs, one at a time, scraping the sides of the bowl when necessary. Add the flour and heavy cream and mix until smooth. Using a rubber spatula, fold in the half of the pieces of Oreos and pour batter into the springform pan. Smooth to make the top even. Pour 1 1/2 cups of water into the Instant Pot and place the trivet that came with the pot in the bottom of the pot. Create a foil sling by folding a long piece of foil in half lengthwise a few times. Place the cheesecake pan on the center of the sling and carefully lower the pan into the Instant Pot. Fold down each side of the sling across the top of the pan. Lock and seal the lid. Pressure Cook/Manual on High Pressure for 40 minutes. Once time expires, turn Instant Pot OFF and natural pressure release for 10 minutes, followed by quick pressure release. Unfold each side of the foil sling and use them to remove the cheesecake from the pot and place on a cooling rack. Remove the foil from the top of the springform pan and allow it to cool to room temperature. Before serving, run a plastic knife around the edges of the cheesecake to loosen it from the pan. Release the springform edge before serving. Top with a layer of whipped cream and chopped Oreo cookies. ← Maryland Crab Cakes Recipe – Authentic and Delicious! Can you cut the recipe in half and use the 3 quart IP? If so, what would the cooking time be? I have never tried it in a 3 quart however all of the other cooking times on other recipes stay the same when cutting the recipe in half or when doubling. So I would think this would remain true with the cheesecake as well. I use 40 minute cook time, It seems overcooked. Should it have be giggly when I took it out? When I make this there is a very slight giggle in the center which firms up as it rests. The cook time has always made the cheesecake perfect for me. However each pot and environment seems to cook just slightly different.